Covington Garden Club Day - Covington Garden Club, Inc. The Mayor was the Guest of Honor at our September Meeting. Mayor Cooper praised the Covington Garden Club for contributions to the community; efforts to beautify the City of Covington and commitment to education. 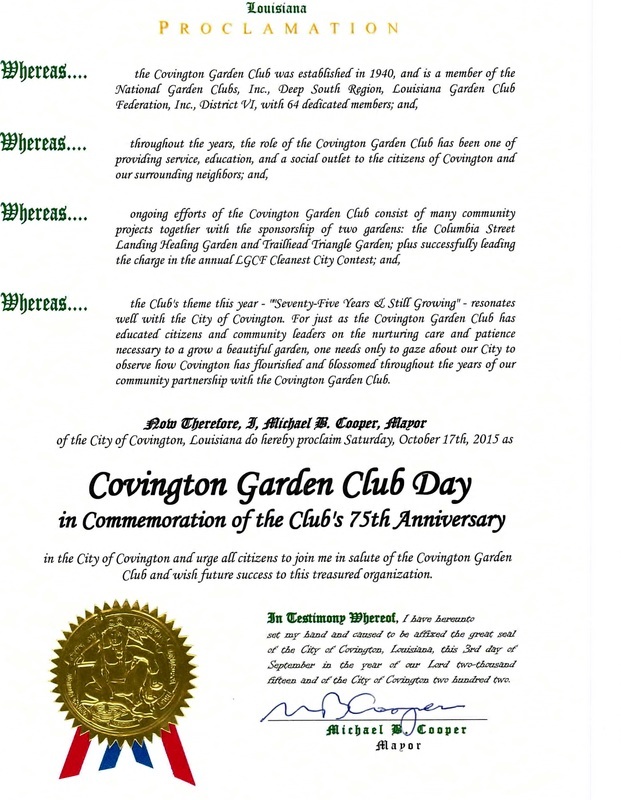 The mayor read the proclamation below recognizing the Covington Garden Club and proclaiming October 17, 2015 as Covington Garden Club Day in Commemoration of the Club's Seventy-fifth Anniversary. Left to right: Anita Nuss, Evelyn Talley, Mayor Mike Cooper, Donis Jenkins and Club President Kyle Martin. Anita Nuss, Evelyn Talley and Donis Jenkins were the most senior members present.